Professional carpet cleaning isn’t as cheap as renting a machine. You want your carpets to be clean and fresh, with dirt, allergens, bacteria and other contaminants safely removed. Many people opt for DIY carpet cleaning based on price alone, without really considering what it will cost them in the end. Before you rent that machine, ask yourself: Is it really worth the time, effort and inconvenience, but more importantly, can it get the job done? 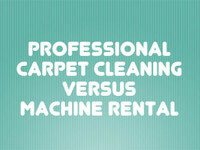 This video weighs the pros and cons of professional carpet cleaning vs. machine rental so you can make an informed decision.